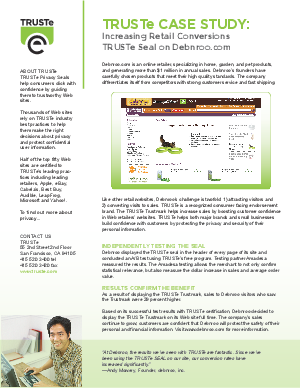 Like other retail websites, Debnroo's challenge is twofold: 1) attracting visitors and 2) converting visits to sales. TRUSTe is a recognized consumer facing endorsement brand. The TRUSTe Trustmark helps increase sales by boosting customer confidence in Web retailers' websites. TRUSTe helps both major brands and small businesses build confidence with customers by protecting the privacy and security of their personal information.